Toyota hopes to reach Generation Y with new ad campaign presenting the Toyota Prius c as a key part of life choices. In an effort to reach out to "Generation Y" with the Toyota Prius c, Toyota is today launching a new ad campaign. The new Prius c campaign, themed on Hasbro's Game of Life, is targeting consumers Toyota feels are in the "entry-phase" of career and family choices, and are looking for a stylish and affordable way to transport themselves around town. The ad campaign is on YouTube, Facebook, Hype Machine, Pandora and Hulu as well as Television. The YouTube landing page (at youtube.com/priusc) will greet users with what Toyota calls a "virtual game board" that has a series of videos walking the viewer through tips for navigating life challenges. These include a "Car Buying 101" video by George Basil offering advice on getting the most out of the "dealership experience"; "Wallet Wisdom" by Danica McKellar offering financial advice; and "Tech Talk with Nye" Featuring Bill Nye and discussing the technology inside the Prius c.
The first of the videos, “Malti-poo,” will premier on March 12 on television, followed on March 19 by another named “Dolphin Tattoo”. The "Malti-poo" features a group of friends playing a game that, looks amazingly similar to Hasbro's Game of Life, and going through a few life choices including getting veterinary care for a dog, and going out to eat. Along the way, the Prius C is presented as an affordable car allowing the characters to choose Acupuncture for the dog, and search for gluten-free food. This demonstrates that Toyota believes the target audience for the Prius c lives the sort of "green lifestyle" that includes acupuncture, healthy gluten-free food choices, and an affordable hybrid car. The commercials will air during network and cable shows such as Grey’s Anatomy, 30 Rock and The Simpsons, as well as programming on Bravo and ABC Family. Online advertising will include “Spin the Wheel” features to see Prius c features solving some of life's dilemma's. The Toyota Prius c was first unveiled in Tokyo as the Toyota Aqua, and is being sold in the U.S. as the Prius c. The Toyota Prius c is smaller than the regular Prius Liftback, making it more suitable for crowded urban areas. The Prius c fuel efficiency is an EPA-estimated 53/46/50 city/highway/combined miles per gallon versus 51/48/50 city/highway/combined miles per gallon for the third generation Prius Liftback. 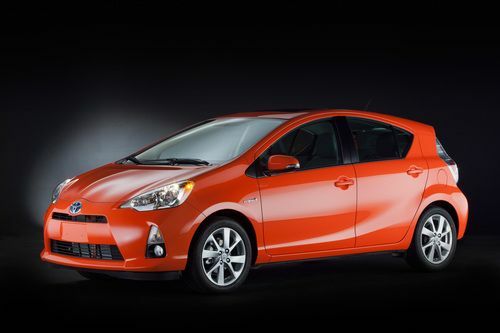 Base price for the Prius c One is $18,950 MSRP, while the Prius c Four has a $23,230 MSRP. The advanced models include Toyota's ENTUNE infotainment system. The Prius c is already on sale, and reports found online suggest lots of people are excited by the car, and that it's selling quickly. According to Toyota, the Prius c has the highest fuel efficiency, in miles/gallon, of any car that does not have a plug.